Some adventures demand gear as adaptable as we are. Trips to unknown locales, adventures with varying conditions, pursuits where space is at a premium, or physically demanding objectives tend to demand adaptability. 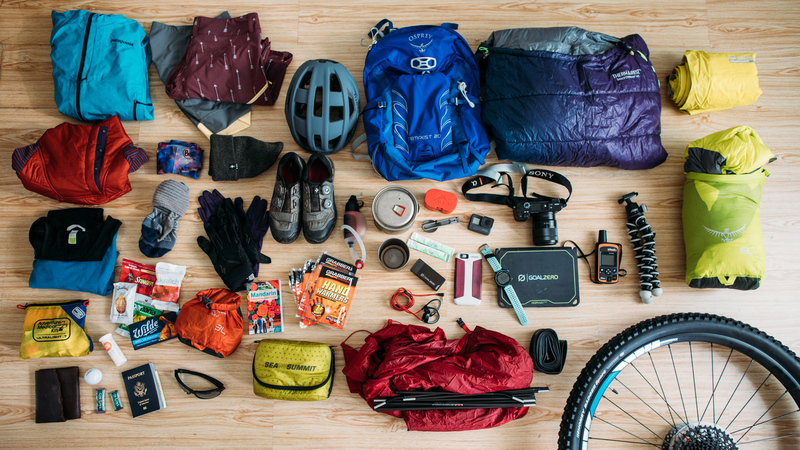 In Alisa Geiser’s case, her trip bikepacking in China checked all these boxes. 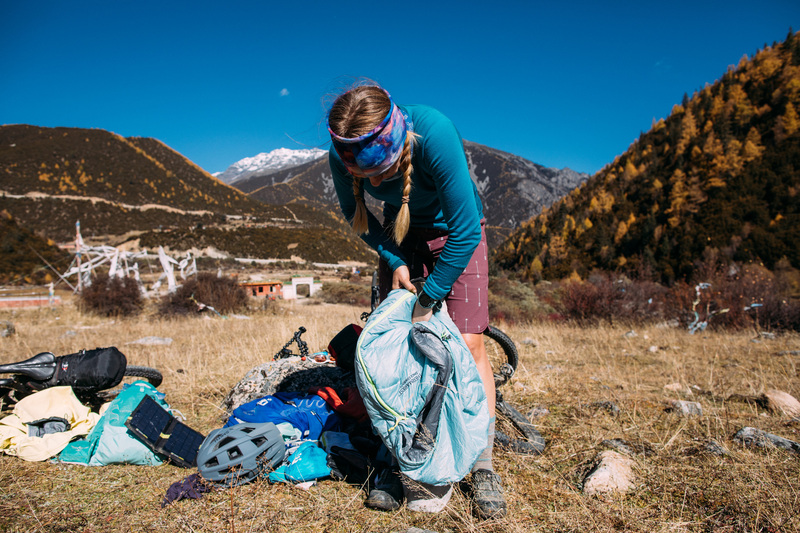 In this edition of Therm-a-Rest Gearshed, contributor Alisa Geiser reminisces about her time bikepacking in China and the versatile gear she depended on. Last fall, my best friend and I decided to bikepack the Tibetan Plateau. Our route took us from the muggy city of Chengdu with all it’s touristy restaurants and shopping malls, over a snow-covered 15,000-foot mountain pass, past hot springs, through Karaoke bars, along windy mountain roads and past many holy sites. We could only pack what we could carry on our bikes—and needed to leave room for the 4,000+ calories a day we’d be burning. One outfit for ten days and as many different environments—what to wear!? Packing for a self-supported adventure is part puzzle, part math equation, and part self-reflection: do I have a true emotional need for the unabridged paperback Stephen King novel, or will reading love poems on my iPhone suffice? Can I really eat four meat bars a day for two weeks, or should I pack a little more variety? There is the personal item or two that you can’t live without – I always bring a leather-bound journal and many pens. My friend Robin brought both a golf ball and a bouncy ball for self-massage when we ran the 420-mile Oregon Coast, and I dare you to ask Aly Nicklas to leave behind her nice shampoo and conditioner. Little creature comforts aside, bulk is perhaps the most important value when bikepacking: you can carry more weight on your frame than on your back, but you need somewhere to put it. Weight is the most discussed aspect of light & fast, but adaptability can override weight in selection when it leads you to a piece of gear that negates the need for another piece. For instance, Dr.Bronners, the proclaimed shampoo, dish soap, deodorant and toothpaste all-in-one. A Gore-Tex jacket can be windbreaker, raincoat, and winter jacket (when layered over your puffy). My trusty Corus quilt follows suit. More on that later. 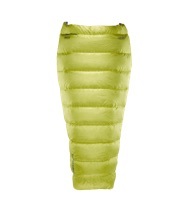 Of course, when a piece of gear is both light, packable, and adaptable, you’ve struck backcountry gold. Material is a core component of adaptability. Take two equivalent tank tops, one made of wool, and one made of cotton. The wool one will provide warmth in dry and wet situations, will be breathable when it’s hot, and won’t stink when you sweat, meaning no washing & yes karaoke bar. It’s four season & wet/dry capable. The same tank made of cotton will only be useful in warm-to-cool dry situations, and must be washed. I barely took off my smartwool tank the entire two weeks we were in China, and only washed it once, after said karaoke bar, because the truth is—nothing is immune to that amount of second-hand smoke. Wool: Light, warm, breathable, odor-resistant, quick-drying, natural, and often fashionable! Be smart – wear wool. Hydrophobic down: The lightest, warmest, most packable of insulation materials IS NOW WATER RESISTANT! Thank you Nikwax. Total gamechanger. Gore-Tex: lightweight, breathable, and waterproof. Boom. I don’t see any reason not to have a Gore-Tex jacket with you at all times. Just in case. Nylon: Nylon is not a four-letter word, homies. It’s classic, and it’s in everything. Tents, sleeping pads, backpacks, climbing ropes. Nylon is tough & keeps you dry, with proper treatment. Gotta give it a shout-out. Sleep is as critical as food when you’re pushing your body to its physical max. 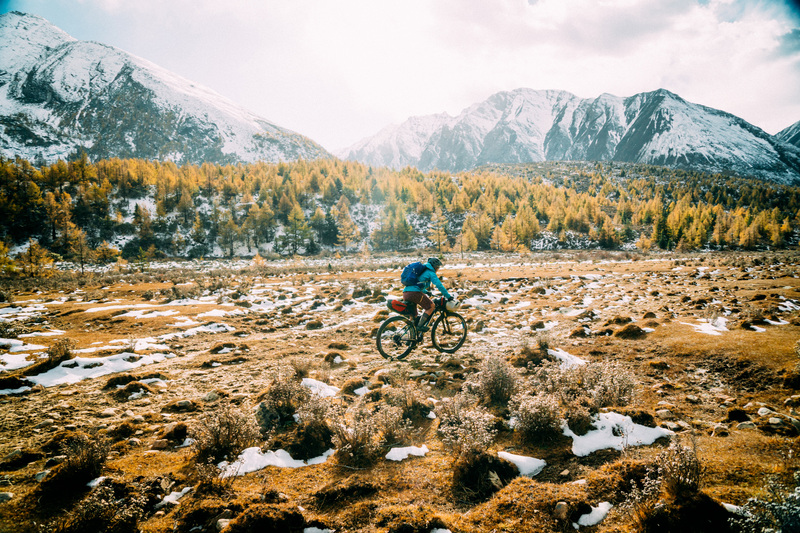 Your sleep system is not a place to make compromise when you’re taking on a challenge like the Tibetan Plateau: the high altitude, unfamiliar environments, and late night visits from wild boar make it hard enough to get proper shut-eye. 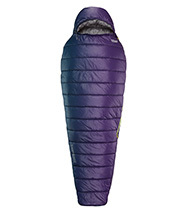 With adaptability & comfort in mind, we went with a three-season, four-piece system, combining the Space Cowboy 45F/7C sleeping bag with a Corus 35F/2C quilt all atop a NeoAir Xlite MAX SV pad, plus a cushy Down Pillow. All assembled, we were prepared for temps down to 20F/-6C comfortably. We had some nights that pushed these limits when we got above 14,000 feet, but thanks to some friendly Tibetan yak herders who sheltered us in their huts, we stayed warm through those too. Moody snow flurries and one glorious crash into a mud pit aside, we were blessed with dry conditions. Had the weather turned her tooth on us, we were prepared with the perfect lightweight material solutions: synthetic fill & the hydrophobic down (see Sammy Spence’s You Can’t Stay High and Dry for a great explanation of how hydrophobic down works). So how about that adaptability – why choose a four piece system? Well, there’s the obvious reason: on warmer nights, you lose the quilt. For all other occasions, you have a quilt. And quilts are the best. 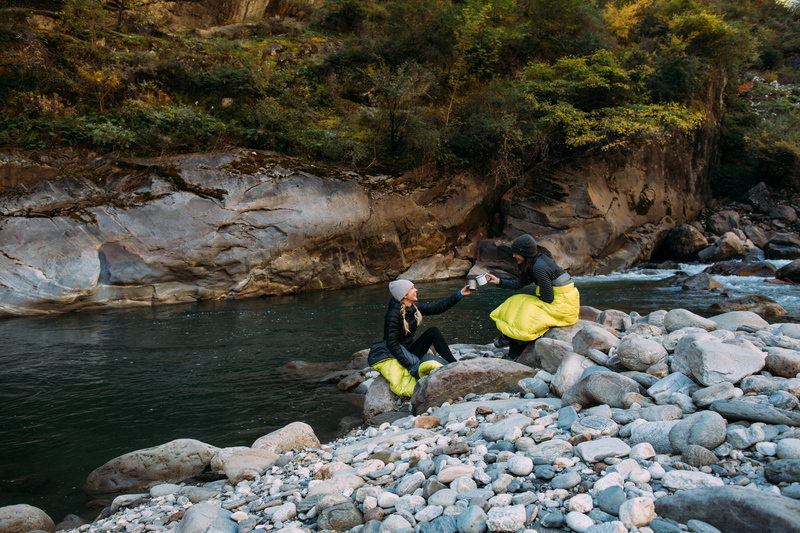 On the bus from Chengdu to Kangding, we created nests with our Corus quilts and down pillows. On misty mornings, I made coffee wrapped in my quilt. In fact, I spent much of time at camp wrapped in my quilt; using it as an insulating layer meant I need to pack that much less in the way of clothes. None of the hostels we stayed at had sufficient bedding: Corus to the rescue. 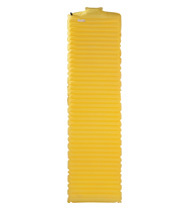 Of course, we made no sacrifice in weight or bulk with these sleep systems. They packed down tiny, at less than 1.5 pounds. Aly and I hypothesized that one of the reasons the Tibetan nomad families were so insistent about bringing us into their camps is that they were convinced we were going to freeze to death—how could those tiny bags possibly hold materials fit for a November night in the Himalayas? With humbling generosity, they offered us their own yak-hair beds and collections of modest blankets bulky enough to fill a wheelbarrow. It took a demonstration of the assembly of our sleep systems to convince them not to freeze on our behalf. We might has well have been pulling bunnies out of hats when we pulled our sleep systems from our bike bags. They laughed as we blew up our mattresses, smiled as we stuffed socks in our down pillows, and marveled at the cushyness of our fully assembled beds. 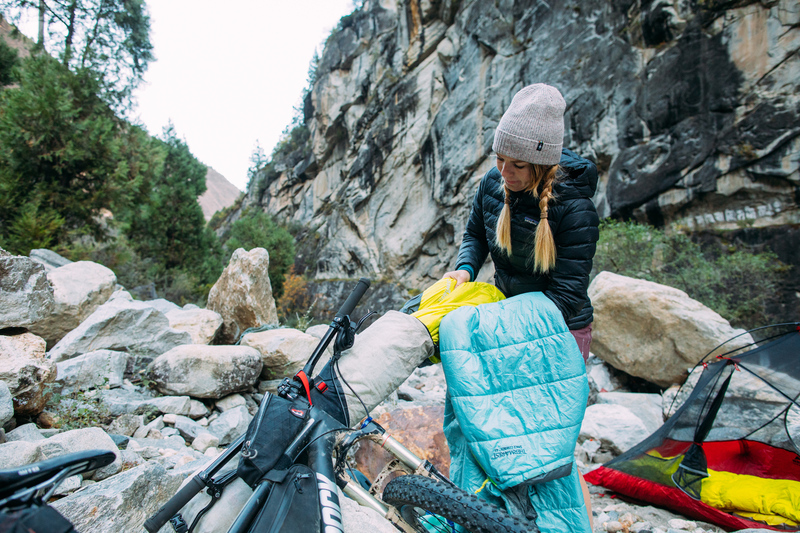 No wheelbarrow needed for transport—only a frame pack. You know what else was more adaptable because we’d chosen adaptable gear? Us! Our rigs were light enough that we could rip single track, bomb rocky downhills, catch air, and crank through streams. And because we were prepared with materials to handle all environments within bikers reach, our road was totally open; we could go anywhere we pleased. And that’s exactly what we did. Alisa Geiser is a writer, filmmaker, and adventurer based in Boulder, Colorado. Through her work, Alisa seeks to illuminate universal qualities found in unfamiliar subjects, with the ultimate goal of promoting positive growth in individuals and society. You can follow her adventures at @alisageiser, Alisageiser.com, or Facebook.com/alisageiser/.